What is the XIRR Function? The XIRR function is categorized under financial functions and will calculate the Internal Rate of Return (IRR)Internal Rate of Return (IRR)The Internal Rate of Return (IRR) is the discount rate that sets the net present value of an investment equal to zero. This guide to calculating IRR will give several examples and who why it's used in capital budgeting, private equity and other areas of finance and investing. If IRR is greater than cost of capital, for a series of cash flows that may not be periodic by assigning specific dates to each individual cash flow. 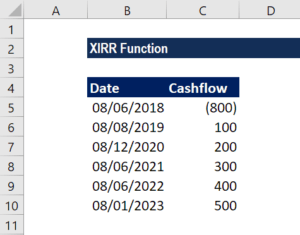 The main benefit of using the XIRR Excel function is that these unevenly timed cash flows can be accurately modeled. To learn more, read why to always use XIRR over IRRXIRR vs IRRWhy use XIRR vs IRR. 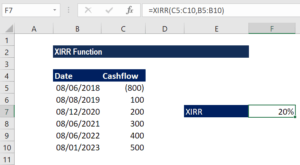 XIRR assigns specific dates to each individual cash flow making it more accurate than IRR when building a financial model in Excel. The Internal Rate of Return is the discount rate which sets the Net Present Value of all future cash flow of an investment to zero. Use XIRR over IRR in Excel modeling. In financial modelingWhat is Financial ModelingFinancial modeling is performed in Excel to forecast a company's financial performance. Overview of what is financial modeling, how & why to build a model. A 3 statement model links income statement, balance sheet, and cash flow statement. More advanced types of financial models are built for valuation, plannnig, and, the XIRR function is useful in determining the value of an investment or understanding the feasibility of a project without periodic cash flows. It helps us understand the rate of return earned on an investment. Hence, it is commonly used in finance, particularly when choosing between investments. Values (required argument) – It is the array of values that represent the series of cash flows. Instead of an array, it can be a reference to a range of cells containing values. [guess] (optional argument) – It is an initial guess of what the IRR would be. If omitted, Excel takes the default value that is 10%. Excel uses an iterative technique for calculating XIRR. Using a changing rate (starting with [guess]), XIRR cycles through the calculation until the result is accurate within 0.000001%. We will leave the guess as blank so Excel takes the default value of 10%. XNPV and XIRR are closely related. The rate of return calculated by XIRR is the interest rate corresponding to XNPV = 0. Dates should be entered as references to cells containing dates or values returned from Excel formulas. #VALUE! error – Occurs when either of the dates given cannot be recognized by Excel as valid dates.